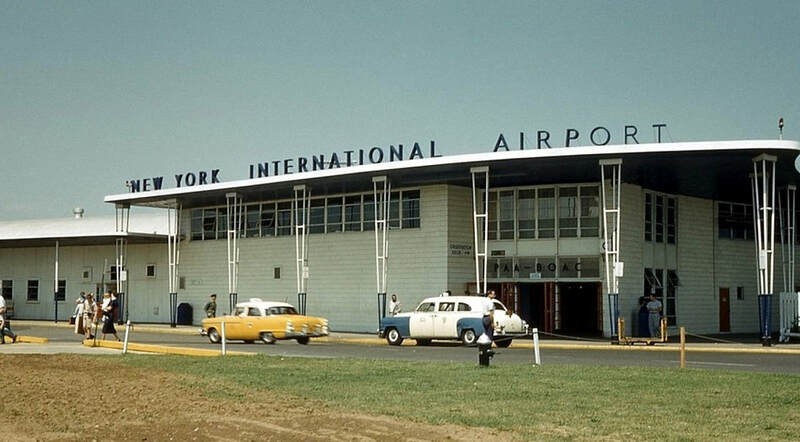 In the third installment of our history of New York John F. Kennedy Airport we will look at Idlewild's opening and early years of operation. We'll also explore the scheme for the airport's long term development. 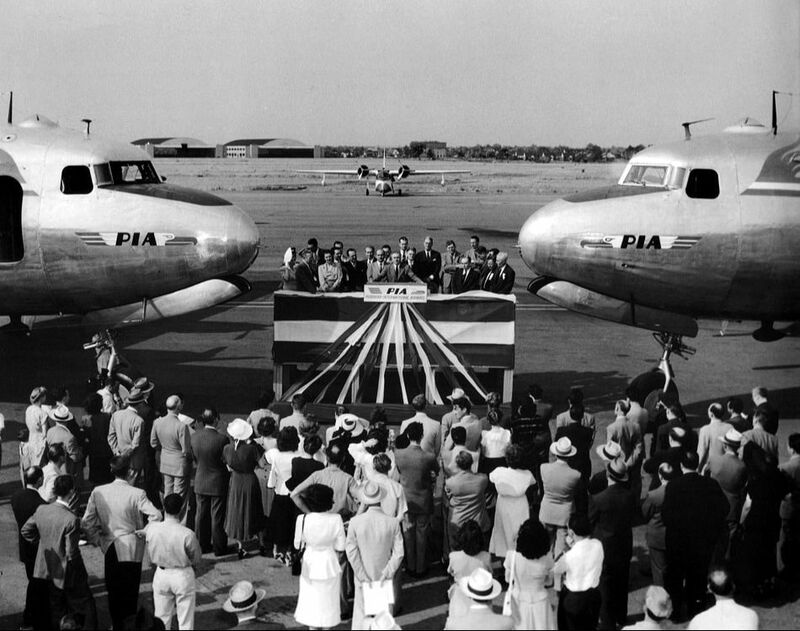 Idlewild was finally opened to commercial flying on July 1st, 1948. Following test and service flights, a Peruvian International Airlines DC-4 from Santiago, Chile, made the first scheduled arrival on July 9th. ​Air France began transatlantic services from the new airport on Bastille Day, July 14th. The flight to Paris took 14 hours and 15 minutes, including three stops for refuelling. 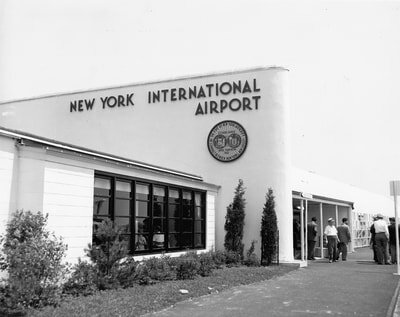 ​Officially named 'New York International Airport', Idlewild was officially dedicated on July 31st, 1948. The opening ceremony was attended by an estimated 215,000 spectators from around the world, including 500 journalists. ​The opening was accompanied by a huge military exhibit costing USD 10 million and included a flyover of the greatest number of bombers, jet fighters and other military aircraft ever assembled in peacetime at the time. ​Other highlights were addresses by both President Harry S. Truman and Governor Thomas Dewey, who were rivals for the presidential election later that year, and who appeared together for the first time for the opening. ​"I'm taking this opportunity to announce to the whole world that we now have the best damn airport in the world." 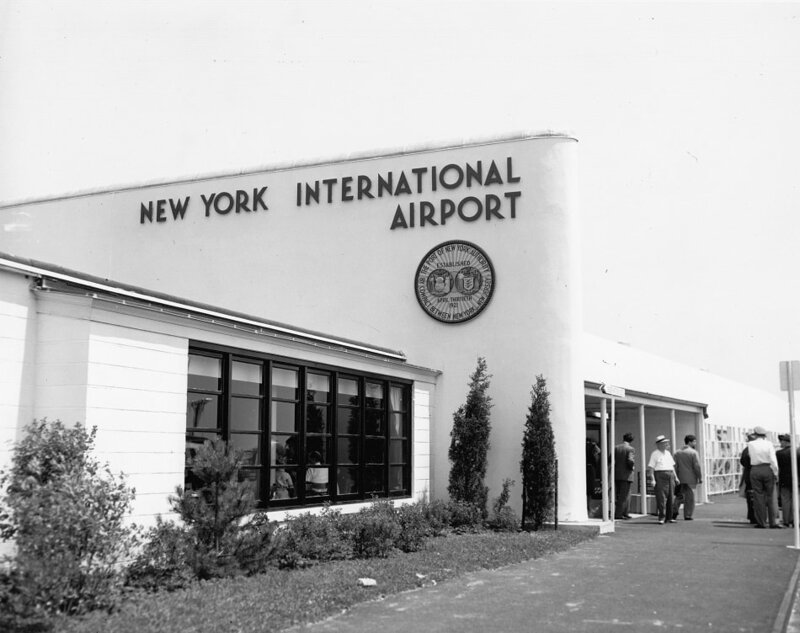 With the opening of the new airport, all transcontinental and transatlantic flights were shifted from LaGuardia to Idlewild Airport. LaGuardia was left to serve flights within an approximately 1,500-mile (2,400-kilometer) range. ​When the airport opened, there were six runways and a seventh under construction. 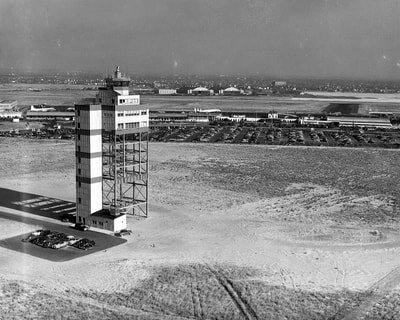 Initially, three of the six runways were put into operation, with two more runways opening in 1949. Runways 01L/19R and 07L/25R were kept in reserve, but finally were never used. 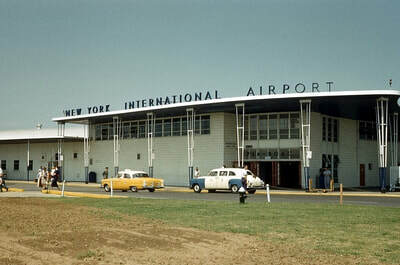 ​Sadly, the force behind the airport, Mayor La Guardia, passed away some six months before the airport's opening. During a speech just prior to his death, La Guardia announced, "I'm taking this opportunity to announce to the whole world that we now have the best damn airport in the world." 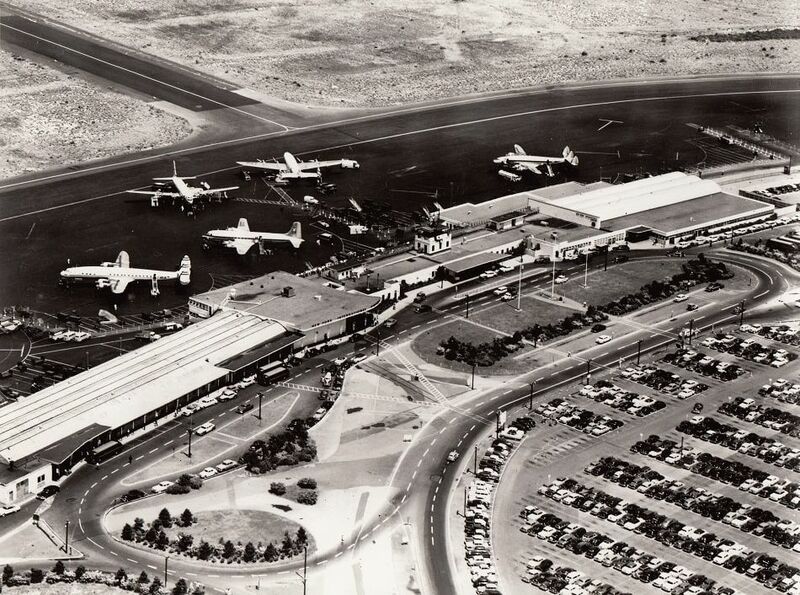 In its first full year of operation, 1949, the airport handled 222,620 passengers and 18,115 aircraft movements. British Overseas Airways Corporation (BOAC) moved in during January 1950 and El Al started service the following April. ​Other foreign airlines starting service from Idlewild included Iberia, Aer Lingus, Avianca and Trans Canada. Major US airlines such as Pan Am, TWA, American and United joined National in the cramped interim terminal. 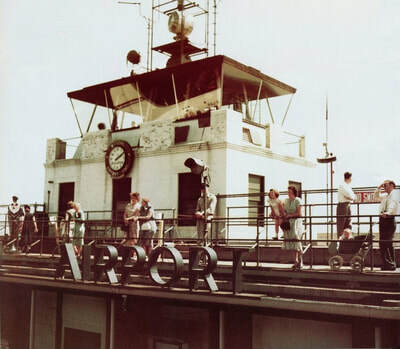 In the ensuing years, the temporary terminal was upgraded and expanded to accommodate the growing traffic. Consequently, the terminal was getting an ever less temporary feel about it. 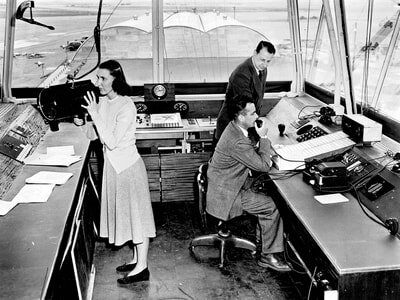 ​In 1949, a new instrument runway (04/22), allowing aircraft to take off with reduced visibility, was put into use. Another major milestone was reached in 1952, with the opening of an 11-floor permanent air traffic control tower, from which ground movements, departures and landings were controlled. This tower was planned to become integrated into the future passenger terminal complex. Other notable improvements were the construction of 11 hangars, an air traffic control center which monitored air traffic movements in the NY area, a large air freight building, and a weather bureau. By the late 1950s, USD 235 million had been spent on developing Idlewild. During the 1950s, traffic at Idlewild was growing at a rapid pace. 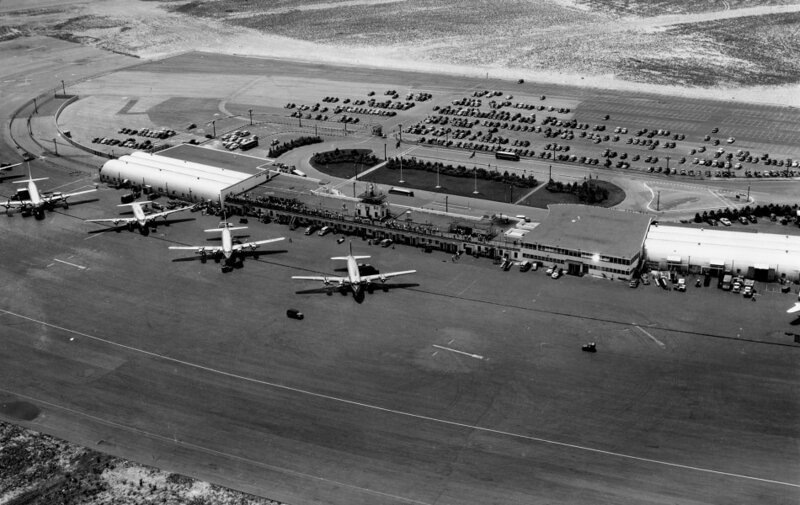 In 1957, the airport handled 5 million passengers. 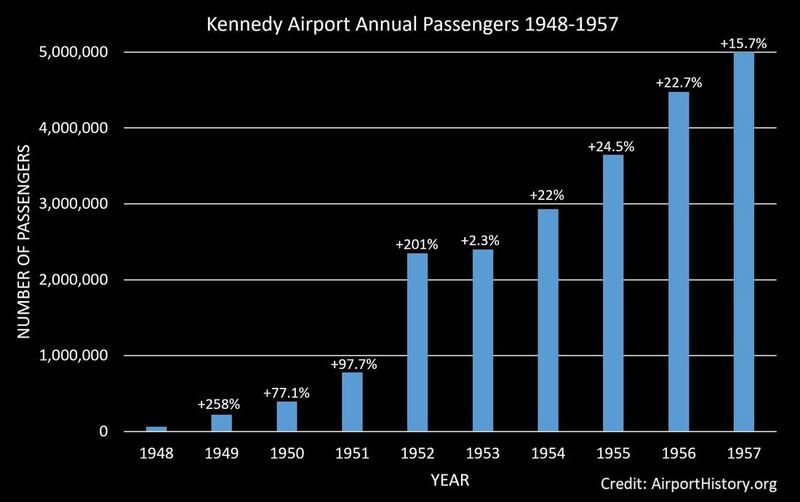 According to traffic projections, passenger traffic would grow to 11 million passengers by 1965 (3.3 million of which would be overseas passengers). 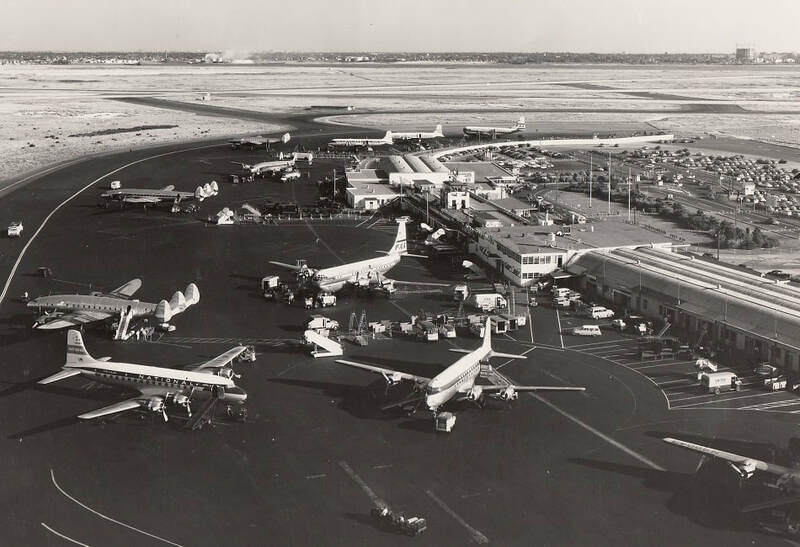 It was clear that modern and expanded facilities were necessary for the rapidly expanding airline operations. ​A single terminal building to serve the projected traffic would have required a structure over 2 miles (3 kilometers) long. Hence, the idea of a single terminal was discarded as it would be too unwieldy from an operational standpoint, unattractive to the tenant airlines, and unnecessary from a passenger service standpoint. 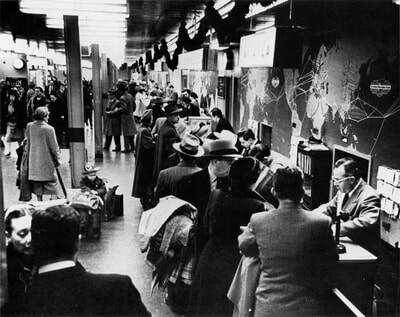 The airlines and their architects had free reign in the design of the terminals. Instead, the planners decided that each major US airline would operate its own terminal. 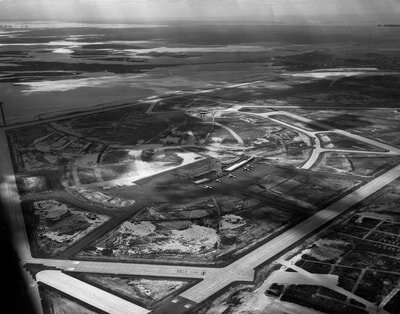 This scheme made construction more practical, made terminals more navigable and introduced incentives for airlines to compete with one another for the best design. The concept would be called 'Terminal City'. 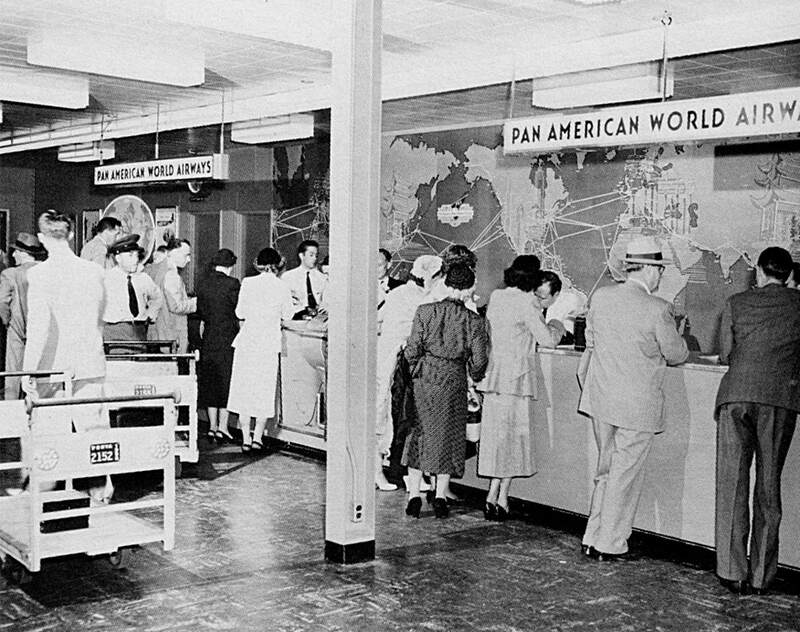 ​Initially, six individual terminals would be built for the exclusive use of TWA, United Airlines, Eastern Airlines, American Airlines and Pan Am. Northwest, Braniff and Northeast would share a terminal. ​All arrivals requiring federal clearance, would be handled in the newly built International Arrival Building (IAB). Inter-national flag carriers would be housed in 'Wing Buildings' adjoining the IAB, within which the airlines could design their own departure station. ​For the time being, the remaining carriers would continue to operate from the existing temporary terminal, until negotiations were complete to replace the building by more modern facilities. 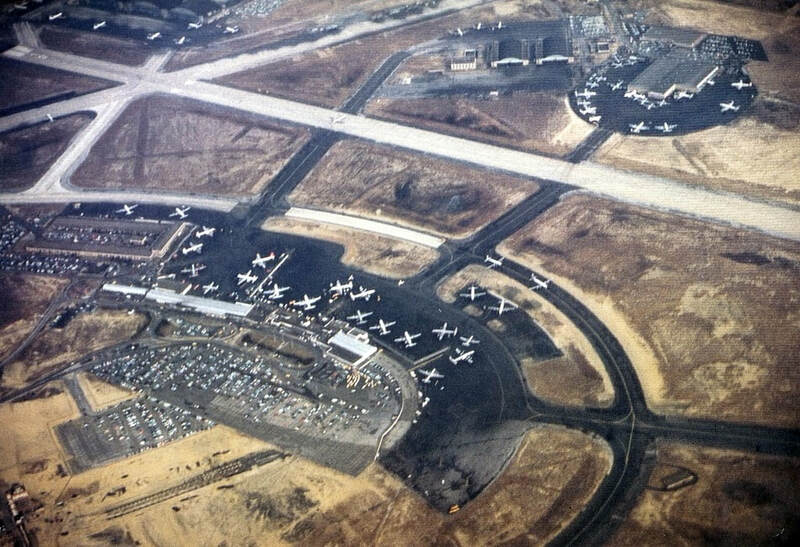 All terminals together would provide a 140 gate positions. 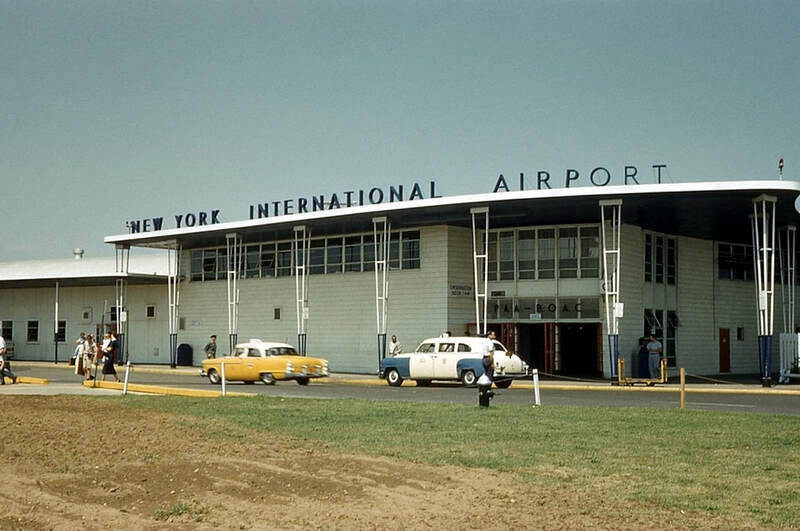 The US carriers were to run their respective terminals while the Port Authority was to be responsible for the IAB and Wing Buildings. passengers transferring between airlines (called 'interlining'). However, due to the nature of Idlewild's traffic, relatively few passengers would have the inconvenience of changing terminals that a decentralized layout would involve. The vast majority (85%) were beginning or ending their journeys in New York or spending some time in the city before traveling elsewhere. Of the balance, only those making online international-to-domestic connections and interlining between airlines, a total of around 7.5% of the passengers using the airport, would have to take a bus between the terminals. 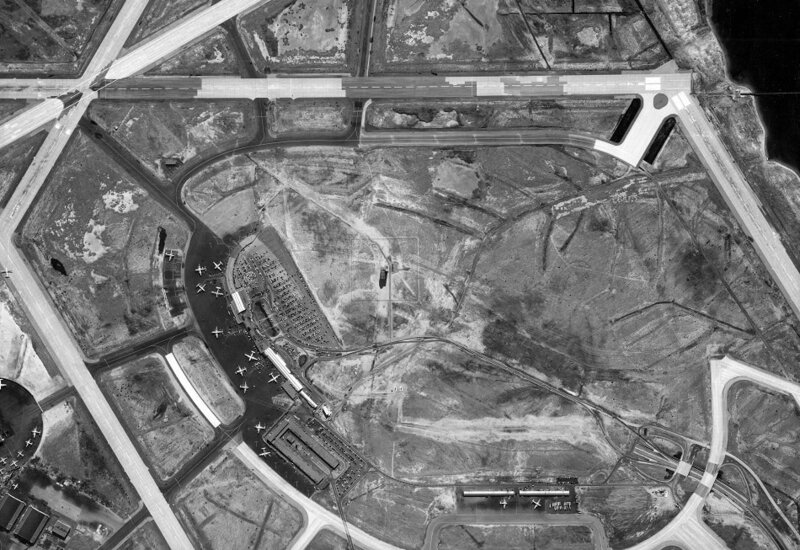 ​With 655 acres (265 hectares), Terminal City alone would be 15% larger than all of LaGuardia Airport. 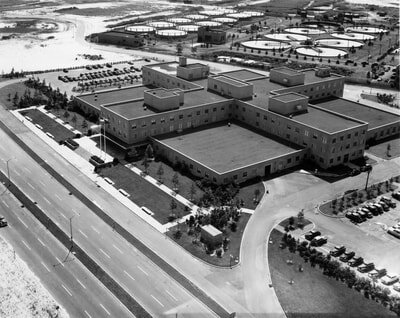 The 1.5 million square feet (140,000 square meters) of floor space in the airline terminal buildings was a about a hundred times that of the airport's original temporary terminal building. 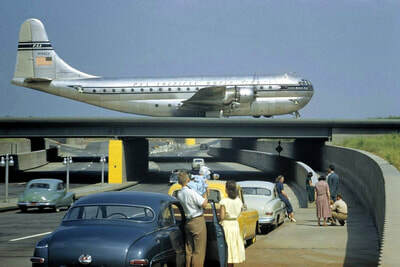 Terminal City was [...] a showcase for the major US airlines--four of which had their corporate headquarters in New York. ​​Terminal City development represented an investment of USD 150 million, including USD 30 million in the International Arrival and Airline Wing Building and USD 97 million in the individual airline terminals. 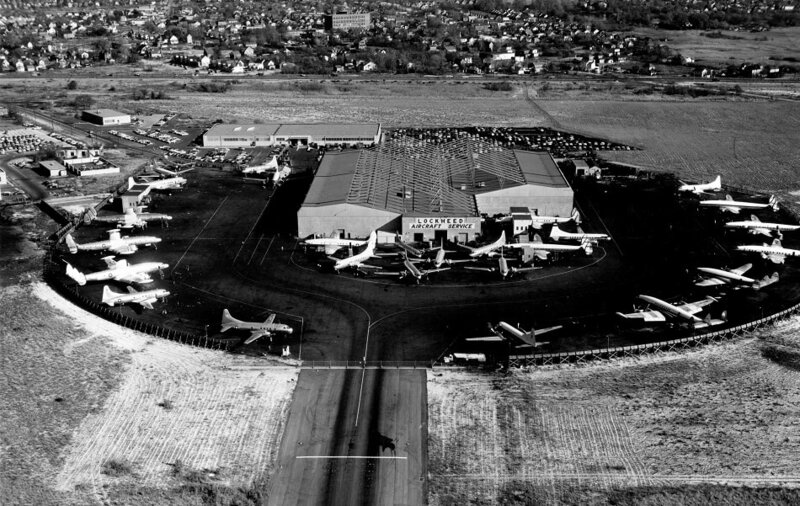 Although Terminal City was the centerpiece of Idlewild's development, it was part of a much larger multi-year expansion program that included the construction of countless other facilities including a new instrument runway, cargo buildings and maintenance hangars. 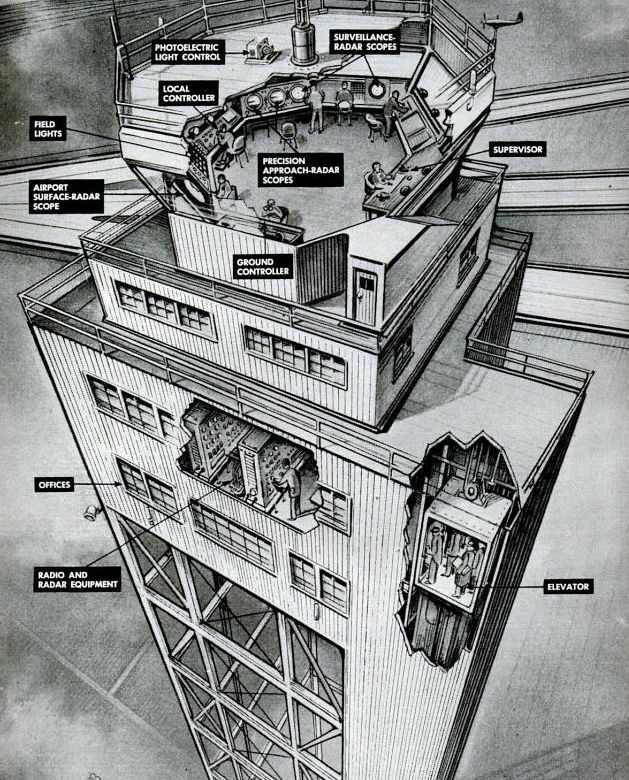 Other than abiding by the overriding necessity of maintaining sightlines from the control tower, the airlines and their architects had free reign in the design of the terminals. ​The designs reflected a variety of different approaches. Landside arrival and departure roadways could either be on different levels or both at grade. Baggage handling could be manual or semi-automated. Aircraft parking could be around the terminal, or around projecting concourses or satellites, while aircraft boarding could be via traditional stairs or covered loading bridges. And if via the latter, there was the question of how many to use and what type. 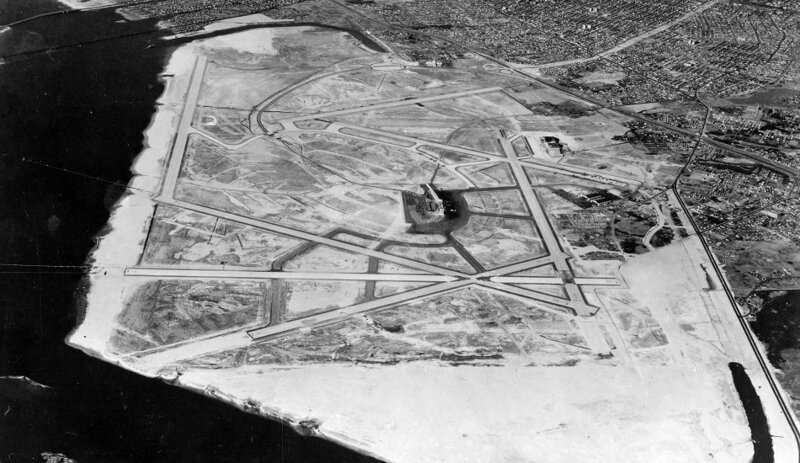 In this sense, Terminal City was a laboratory of airport design. ​It was also a showcase for the major US airlines--four of which had their corporate headquarters in New York--and the foreign flag carriers whose responsibilities included promoting their countries in the US. This brings us to the end of Part 2. Curious how Terminal City turned out? Click here to read Part 3!